We hope everyone had a wonderful Fourth of July! This weekend MOM’s Organic Market is having their Grand Opening event. 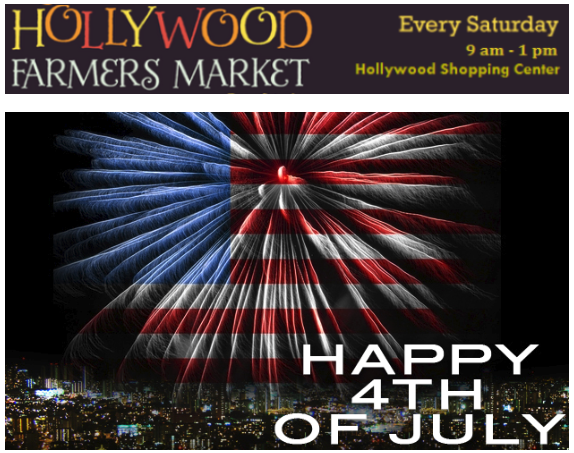 The Hollywood Farmer’s Market will still be open but the parking lot may be a little more crowded. 🙂 Please be aware of parking restrictions. Waltz Family Farm has a new supply of beef and pork. Make sure you stop by and see what Jay and Laurie have. Buying local is good for you, good for the local economy, and good for the planet! Buying from local farms helps you get products that are fresher, and have traveled much shorter distances overall from farm to fork. Plus, you’re supporting independent family farms which helps strengthen the economy. Stone Hearth Bakery is looking for someone to sell their product at our market. If you know someone who lives in or near Fredrick and wants to help Stone Hearth please let Julie know. The bus has been masked, primed and painted- all in the heatwave. Shanice reports they will have a video up on their website soon and more details to follow.